Electronic and Paper Claims. Statements. Aging. Follow-Up. NowMD’s Billing Center is the only place you need to go to see everything related to billing and collecting the money you’ve earned. 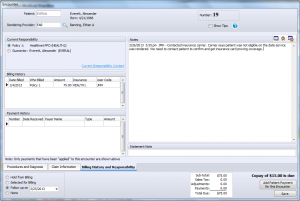 Define the Billing Center view for each user. 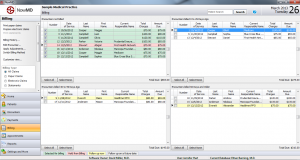 Select the number of rows and columns, the age of the encounters to display and encounter fields to include to give at-a-glance information you need. The Billing Center is organized into aging areas. Choose the screen layout that’s best for you – Define the number of rows and columns to be used to display encounters and their billing status. The first column is always unbilled encounters. These are the services that have been entered and have not yet been billed to an insurance carrier or guarantor. The remaining columns display encounters based on the time that has passed since they were billed – 0-29 days, 30-59 days and 60 days and older for example. You can instantly see the encounters that have not been paid and how long they have been outstanding! Electronic claims, paper claims and guarantor statements each have separate views that offer the same collection and follow-up tools. A few clicks are all that’s needed to send electronic claims, print paper claims and produce patient statements. No Flood of Calls When Statements Are Mailed! Guarantor statements can be sent immediately when the guarantor becomes responsible for a service. There is no need to save statements and send them all in one big batch. Double-click an encounter in one of the past-due columns, make a follow-up call to the insurance carrier or guarantor, note the conversation and a follow-up date, save it and move to the next past-due bill. Color coded flags communicate the state of each encounter: Red for Hold from Billing, Green for Selected for Billing, Gray for Follow-up in Progress and Yellow for Follow up due reminder. No aging reports or work lists are necessary to tell a biller exactly what needs to be done! 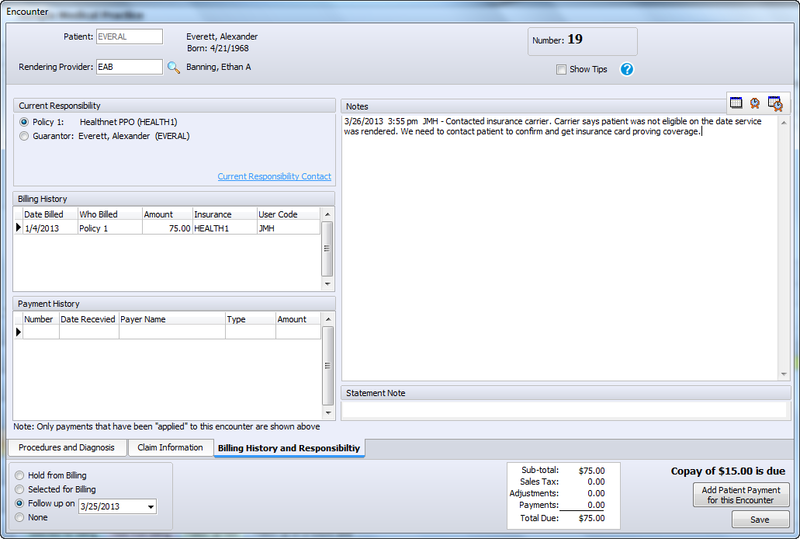 Each encounter shows billing dates, current responsibility, payments, adjustments and tracks follow-up information. Don’t lose another payment because you missed a timely filing deadline! Every encounter with a balance is shown in the Billing Center. Information on unbilled and past-due claims and statements cannot be overlooked – Only when an encounter reaches a zero balance is it removed from view.